Egyptian magazine claims that six Islamist activists who work with Obama are Muslim Brotherhood operatives. An Egyptian magazine has claimed that six American Islamist activists who work with the Obama administration are Muslim Brotherhood operatives who enjoy strong influence over U.S. policy. The December 22 story was published in Egypt's Rose El-Youssef magazine and was translated into English for the Investigative Project on Terrorism (IPT). The story suggests the six turned the White House "from a position hostile to Islamic groups and organizations in the world to the largest and most important supporter of the Muslim Brotherhood." The story is largely unsourced, but its publication is considered significant in raising the issue to Egyptian readers, IPT said. Elibiary also played a role in defining the Obama administration's counterterrorism strategy, and the magazine asserted that he wrote the speech Obama gave when he told former Egyptian President Hosni Mubarak to leave power but offers no source or evidence for the claim. Rose El-Youssef also said that Patel maintains a close relationship with Hani Ramadan, the grandson of Brotherhood founder Hasan al-Banna, and is a member of the Muslim Students Association, which it identifies as "a large Brotherhood organization." Despite the fact that the Muslim Brotherhood regime in Egypt was voted into power on an anti-U.S. and anti-Israel platform, it is about to receive 20 F-16 fighter jets from the U.S. The jets were ordered by Mubarak, but the Muslim Brotherhood will take over the inheritance. The Obama administration has also indicated its willingness to help Egypt relieve $1 billion of its debt, as part of an American and international assistance package intended to bolster its transition to democracy. A video released last week showed that in 2010, current Islamist President Mohammed Morsi called to boycott products made in the United States because of its support for Israel. At the time he also rejected negotiations between Israel and the Palestinian Authority and referred to Jews as "apes and pigs". 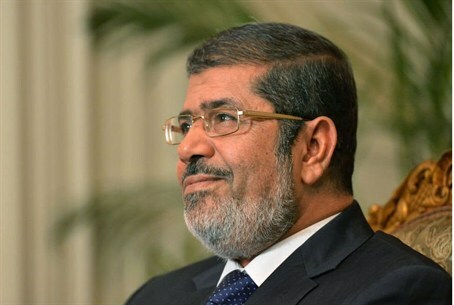 Previously exposed videos show that during his election campaign, Morsi reiterated that "Jihad is our path" and "the Koran is our constitution". Sheikh Mohammed Badie, the supreme guide of the Muslim Brotherhood and the person who some say is the true president of Egypt, has called for a jihad (holy war) to liberate Jerusalem from Israeli rule.